Located in the East Midlands of England, the Derbyshire County is home to over 1,000,000 residents. Its topography consists mostly of rolling hills and uplands and is home to England’s largest national park. Using LeafletJS, the GIS department at Derbyshire County hosts a dozen public facing web map applications. Tasked with informing their local residents and community stakeholders on events, road work, infrastructure information and more. Over the past few years Derbyshire County has tracked their web presence with analytics to help allocate future IT resources and projects. Assigned with reviewing its current web map applications for possible redevelopment, the Derbyshire GIS Department, using Google Analytics as their main analytics tool, were looking to get concrete data on whether or not an overhaul to their web maps was necessary. Google Analytics showed that there were a few thousand visitors a month visiting their web maps. Not fully understanding how visitors were interacting with the maps themselves proved to be a major blind spot in their efforts to properly analyze their visitors. The team wanted metrics for their Gritting Routes and Snow Removal web map, which seemed to have a lot of traffic; However, they still received many phone calls and requests. To determine if there was an issue with the user experience of the web page and the map, the team turned to Maptiks for deeper insights. 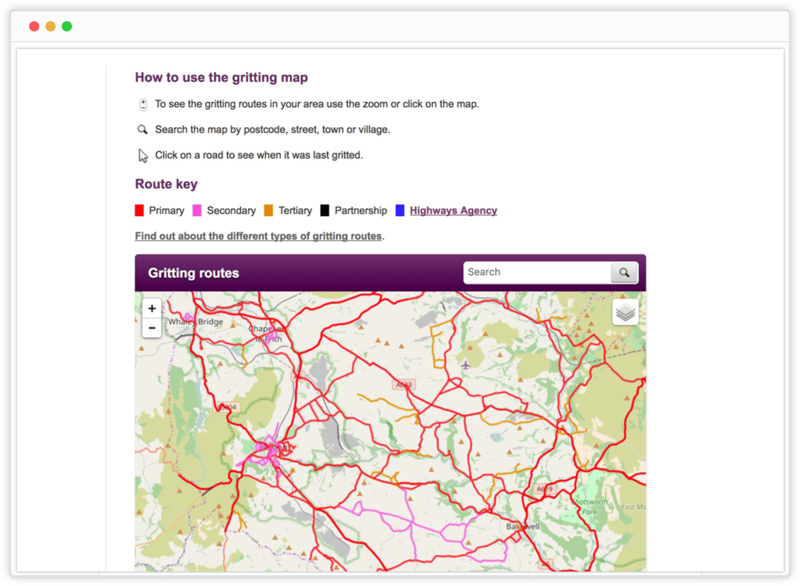 Derbyshire County set out to find insights into user activities, and identify whether their gritting routes and snow removal map was being used by its residents. With the help of Maptiks, the team at Derbyshire County decided to track their users interactions to help understand the usage on the map and determine whether or not visitors were interacting with it. Derbyshire County tracked visitors, map usage, bounce rates and other key engagement metrics. To the teams surprise, activity levels were high. On average their visitors interacted with the map 11/times per session. Their map bounce rate was slightly too high compared to industry standards. With a 37% overall bounce rate, 50% on desktop devices and 32% on mobile, this suggested that mobile users were much more engaged. With the now proven assumption that most residents are using their mobile devices on the fly to get up to date information, the GIS Department decided to revamp their current web maps, and focus on the mobile users. Are you ready to #buildabettermap?